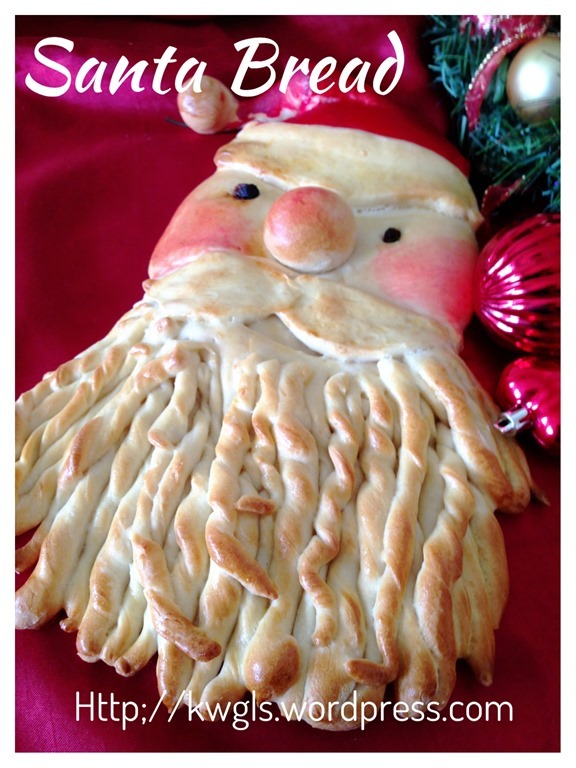 I decided to bake this cute bread also because I have plenty of free times since my kids was on holiday. 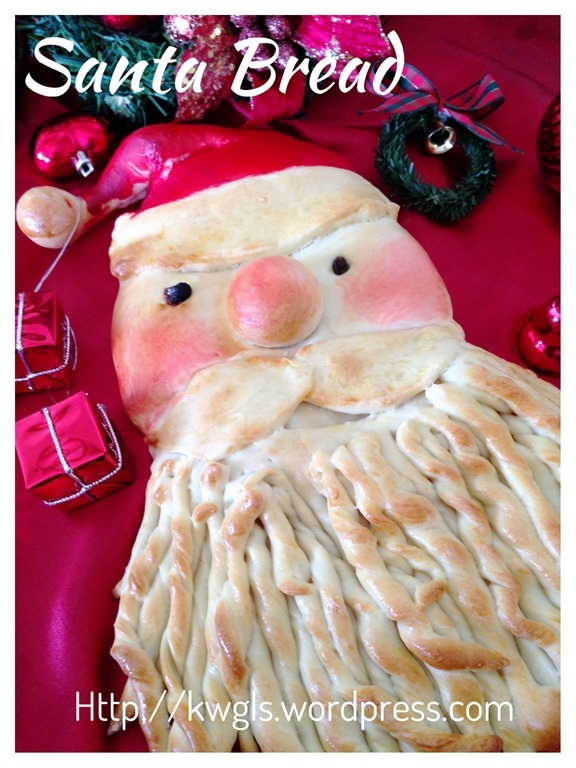 I have more time to prepare bakes that need full concentration and more laborious recipes..
Hmmm, I am not going to eat the bread… Hold on.. Not the bread is not edible, it is because I want to sun dry it and show it to my kids when they are back from Holidays after Christmas.. This is not a recipe sharing but a shaping sharing. 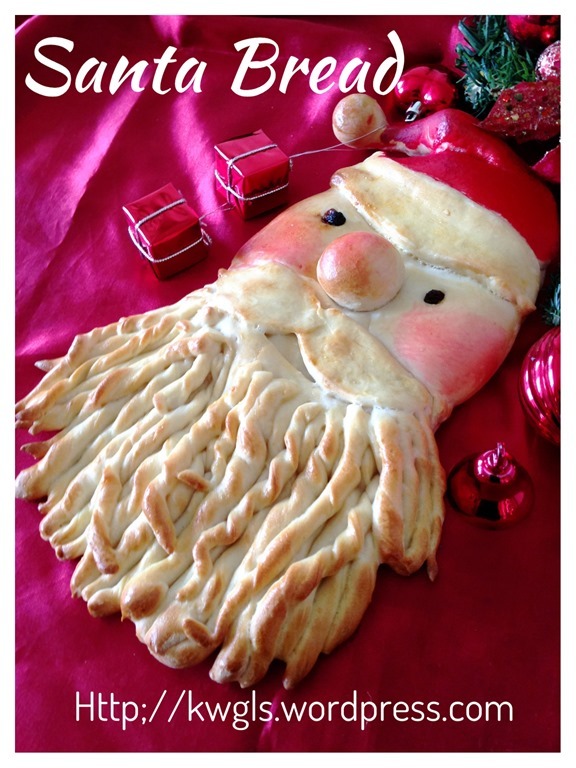 It will definitely be a centrepiece on your Christmas table .. Again, the bread is edible if you are using an edible recipes. 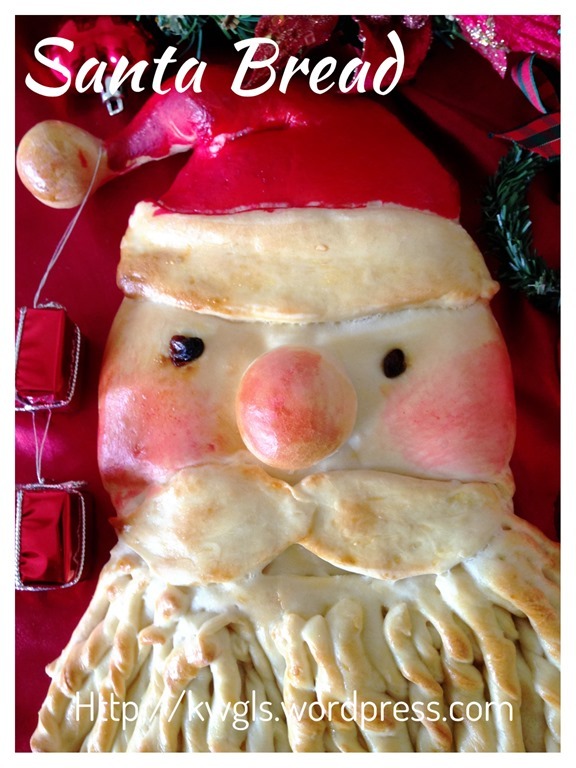 For edible bread dough please refer Basic Bread Dough Recipe . The shaping shall be done after the first proofing of double in size. For non edible bread dough, mixed 250 grams of plain flour, 1 teaspoon of yeast and 120 grams of lukewarm water. Knead until it form a pliable dough. Let it rest for 10 minutes before shaping. Divide the dough into 4 portions. 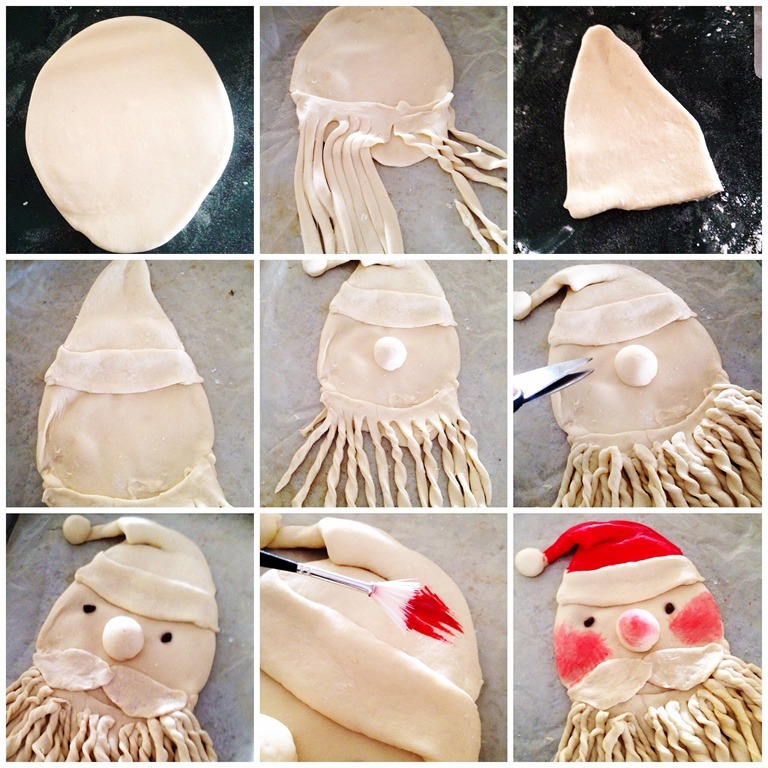 Portion 1 for face, portion 2 for beard, portion 3 for hat and portion 4 for all the other smaller items such as nose, hat collar, moustache, etc.. Additional left over dough will be used for the shaping of moustache. 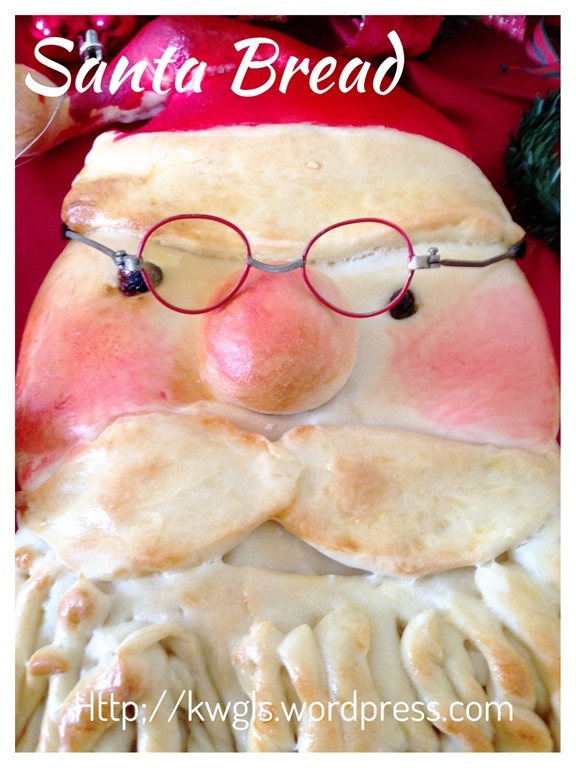 Take one dough, shape round, and roll it thin in the shape of a face. Take the second portion, roll it like a semi circle, use a knife or scissor to cut into 1 cm broad strips resembling the beard. Do not cut too near the straight edges and stop the cutting at about 1cm from the edge. Slightly twist it to make curly beard. Attach the beard portion to the chin of the face. Take the 3rd portion, leave about 20%, use the remaining 80% of the dough to make it into triangular shape. Attached to the head. Use the remaining 20% of the 3rd portion to make a collar for the hat. Slightly fold the top of the hat towards the hat collar. For the fourth portion, pinch a small dough, shape round and attached to the tip of the hat. 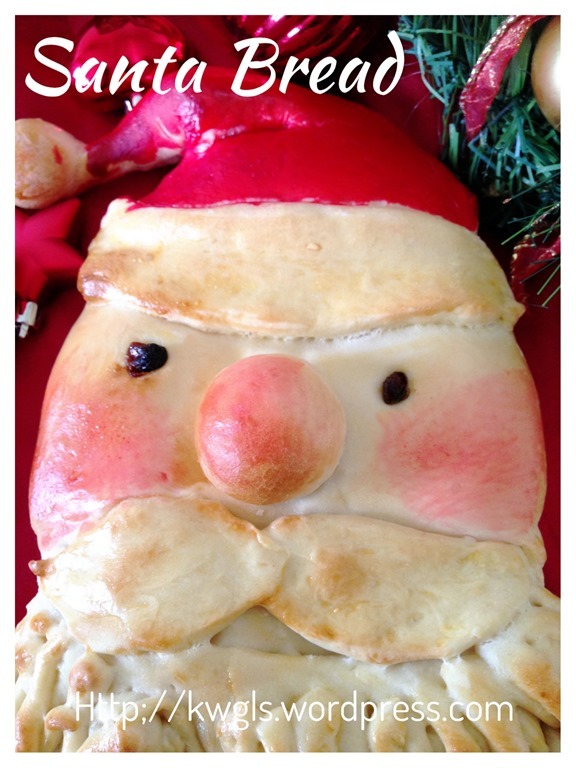 Pinch another slightly bigger dough, shape round and make the nose. Pinch another 2 small dough, roll like shape of leaves to make the moustaches. 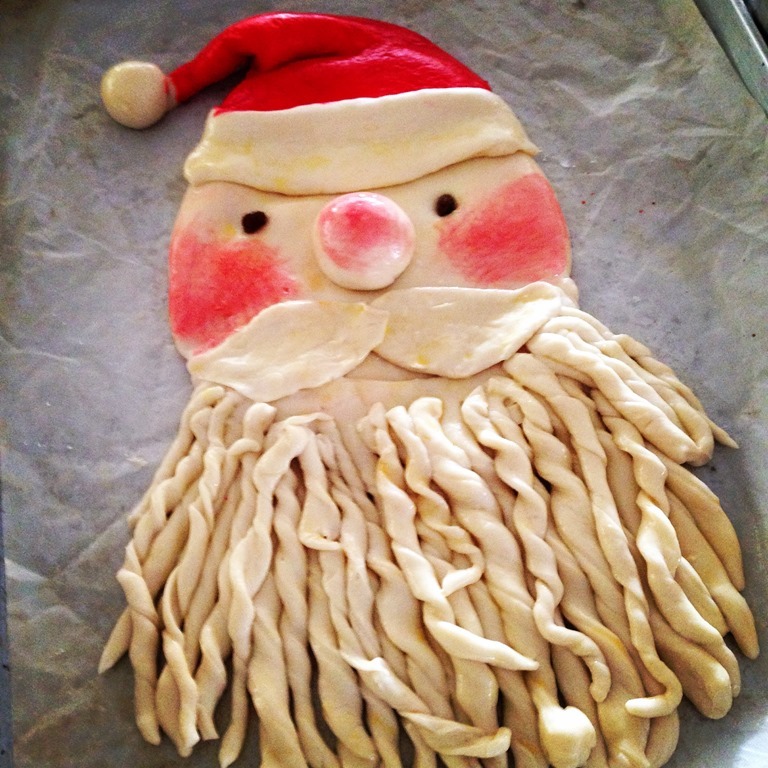 For all the remaining dough, if any, make it into thin strips, slightly twisted and attached to the beard portion. Use a small scissors to cut two small cavities for the eyes. Put 2 dark currants or raisins as eyes. Use a brush to brush some some red colouring gel on the hat.. Dilute the gel with a bit of water and brush on the nose and cheeks resembling rosy cheeks. Egg wash the bread thoroughly before baking in the pre-heated oven of 180 degree Celsius for 15-20 minutes depending on the thickness of the bread. If it brown too soon, off the the top heat of the oven.. 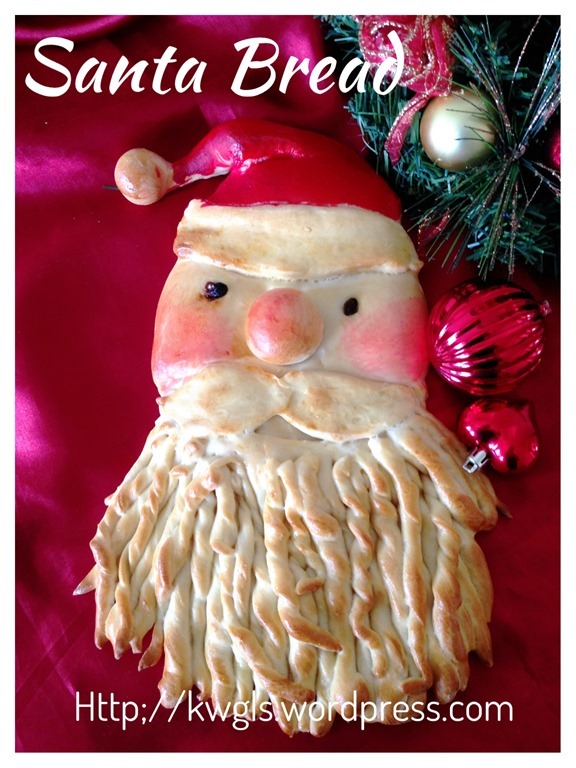 It is fun and a self achievement to prepare this bread for me to share with readers. I do hope readers can try preparing this too.. 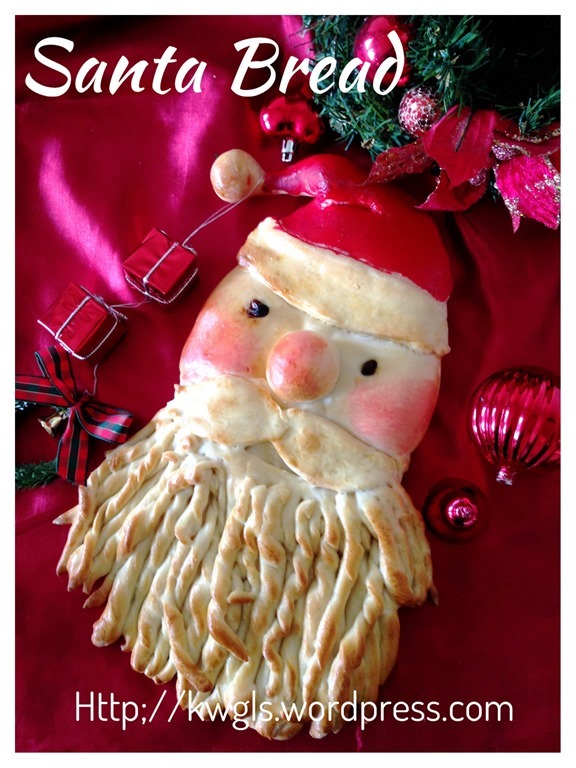 This entry was posted in Breads and Pizza, Christmas, Christmas 2013, Food Preparation Series and tagged 8, Christmas 2014, Golden Santa Bread, GUAI SHU SHU, Guaishushu, kenneth goh, postaday, Santa bread, 圣诞老人面包. Bookmark the permalink.